I woke this morning with a hankering for black coffee and pumpkin. So for the first time ever I decided to make pumpkin porridge Kimi style. I put on the oven to roast a wedge of pumpkin while brewing aromatic coffee beans, before settling in to start writing my morning journal. Inspiration was flowing onto the page from my pen and so was my fascination for the first pumpkin porridge I had ever made. I figured pears are a nice companion with pumpkin - soft, mellow but with a distinct flavour and texture on the palette. Hence I threw a pear cut into eighths into the oven as well to roast. I have just finished eating it and I have to say if I had made more I would be eating a second bowl right now. 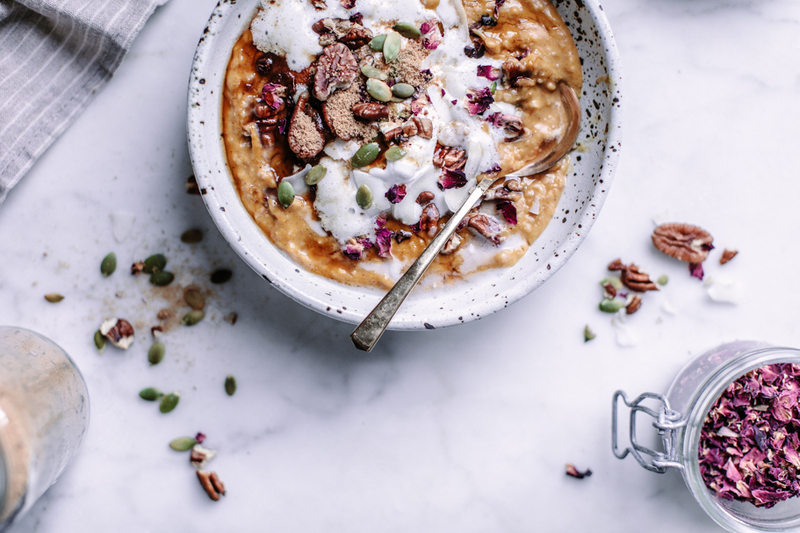 I loved it and if you ever get a hankering for pumpkin in the morning try this warm and nourishing porridge, it’s a pleasure to eat. 1/4 cup roasted pumpkin mashed - this could be left over from the night before. Put the oats, spices and coconut milk into a saucepan over a medium heat and cook, stirring occasionally for about 10 minutes. Then add in the mashed pumpkin and stir until the pumpkin is heated through. If you like your porridge a little runny add more coconut milk until you have the consistency you want. Place porridge into a bowl and top with pears, coconut yoghurt, nuts and coconut flakes. Then sit down, relax and enjoy this mouth watering and nourished breakfast. *You can substitute oats for Buckwheat which needs to be soaked overnight first.